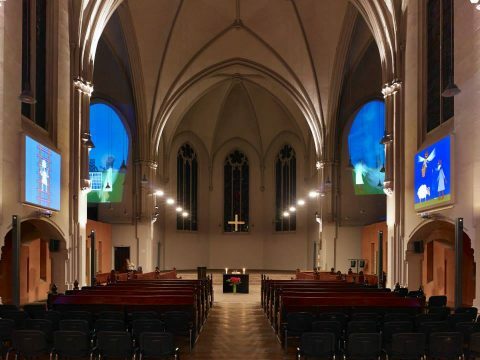 Fenestræ is an 8 channel video installation trying to restaurate the original stained glass paintings of the Church of St.Johann which were destroyed during the second world war. The original paintings were depicting different stories from the life stories of prophets such as Eve & Adam, Abraham, Moses, John the Baptist,David & Nathan and Jacob. I made contemporary interpretations of these stories as animations adding two more stories of Jesus of Nazareth as a tekton (craftsme n) and of Mary Magdalene as an apostle (messenger). Eve and Adam are standing on a green plane. Adam is slightly elevated by a tree trunk, symbolizing the cheating advantages granted to men in social life. Suddenly – like the love – an apple comes down deus ex machina. They fall in love. Then they start to bite the apple. Quickly they eat it up. The love is over. They cry. After a short time everything starts over. Even the persons change the love grows again and again. Abraham who once was stopped by god sent angel from sacrificing his son is now about to sacrifice this ram. He is once again stopped doing this as the angel throws him vegetables making him to drop his knife. Abraham keeps trying. Jacob is on the ladder. He keeps climbing but he never reaches the sky. The way is the goal. Moses is in the work of Mert Akbal an african woman. She guides her people on a stormy sea. The ship goes to nord as we see the stars rotating on the sky around polaris. In his first conflict David killed the giant Goliath with his sling. This lead to his anointing as the king. King David made lots of wars in his life and commited many atrocities in these wars. During his conversations with the prophet Nathan he was made aware of these atrocities and regreted them in the rest of his life. Today there are modern projectile weapons which are descendants of a sling. The most deadly of them are drones. These unmanned combat air vechicles are used to kill alleged criminals without trial. Furthermore they often hit civilians causing deaths of many non combatants. In Mert Akbal’s version of the story we cant see David, maybe because he controls the drone remotely and the spectator of the animation takes the role of the Nathan self. He holds two plastic bottles in his hands. He is in a ice cave and stands in water up to his knees. He fills the water into the bottles and pours them back causing the reduction of water level. Jesus was a craftsman, working with his hands. He stands in an industrial landscape. Out of a distant well oil is spitted on solar panels before him. He stays calm and cleans them continuously. Our knowledge about the story about Mary of Magdalene is based on scripts which were kept by man, in a time when a female being was not allowed to design the spiritual life with words and writings. The equal disturbance of knowledge is the key to equality not only between genders but also to the equality between all the social groups and classes.